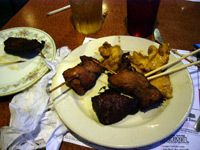 I went to the first buffet Chinese place I've been to since I vowed never to go back to the City Lights Cafe in DC. 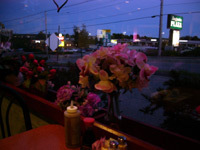 The China King, 57 Western Ave, Augusta, ME 04330, was one of the strangest Chinese buffets I have ever been to. 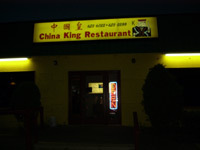 It was staffed with what appeared to be authentic Chinese people, but their accents were not. I began to wonder if they even knew Mandarin. I asked for tea. It was the blackest tea I'd ever been served at a Chinese place. I soon switched to ginger ale. The plates of meat were good. I ate chicken, pork, and string beans. They were all great. Then the woman brought me some beef. Terrible! Chinese places, please don't use corned beef and try to make teriyaki beef out of it!! Before I left another party ordered tea, they took one sip and rejected it. The most mediocre part- my fortune: "Practice makes perfect."